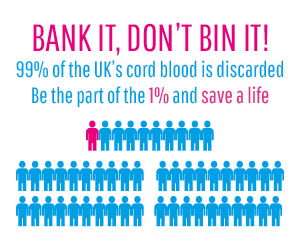 Unfortunately, the vast majority of cord blood in the UK is discarded. This is simply because many expectant parents are not aware of the value and importance of cord blood and the stem cells within it. Parents are also unaware that they have options available to them to save this precious resource from incineration. The types of cord blood bank in the UK mean that parents have the choice to save their baby’s cord blood in one of two ways. A family bank allows cord blood storage exclusively for the use of the baby and family or in a public bank where the cord blood can be used for research and to treat members of the public who need a stem cell transplant. There are many reasons to save cord blood and the reasons vary from family to family. Here are Cord Blood Aware’s top 10 reasons to save cord blood. The stem cells found in cord blood have been used in over 30,000 transplants worldwide including treatments for life-threatening conditions such as Leukaemia, Neuroblastoma & Lymphoma. Stem cells in cord blood are being used to treat children with Cerebral Palsy – trials and studies have published promising results for this otherwise incurable condition. It is currently estimated that 1 in 3 people will benefit from therapy using family banked cord blood stem cells in their lifetime. Stem cells in umbilical cord blood CAN and DO save lives. There is a shortage of black, ethnic minority and mixed heritage stem cell donors. 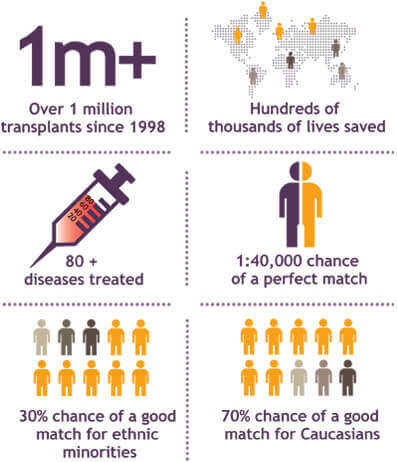 Cord blood banking can increase the chances of people from these communities finding a stem cell match. Storing cord blood in a family bank could give your baby and your baby’s family access to clinical trials should they ever need it. Cord blood is the most stem cell dense source of stem cells from the human body. Additionally, cord blood stem cells are stored in their prime condition; they have not had the opportunity to degenerate or be exposed to environmental factors which could affect them. Cord blood collection is completely safe and painless for both mother and baby. The cord blood is collected after the baby and placenta have been born, after the umbilical cord has been cut. The placenta and cord are taken away for the cord blood to be harvested. Cord blood stem cells are collected through a non-invasive procedure. Other sources of stem cells require invasive procedures to collect them. Not making a choice about your baby’s cord blood means it is destined to be discarded and will be lost forever. Banking your baby’s cord blood is a once in a lifetime opportunity. Learn more about cord blood.